Forward in Faith relies on income from our members, and donations from others who support us, to fund our work. To join Forward in Faith, please follow this link. Forward in Faith metal lapel badges are available for members at £2 each (inc. p&p, payable in advance). 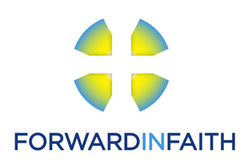 If you would like to make a donation to Forward in Faith, please contact the office. Please also consider including a bequest to Forward in Faith in your Will. For information on how to do this, please follow this link.